Today saw Airlander 10 commence the next exciting stage of flight testing, known as Airworthiness Release 2a (AWR2a), which will see Airlander fly higher, faster, further and for longer than before. A number of modifications and upgrades were carried out recently, to allow for the expanded test parameters. We flew a confirmatory flight today prior to a more intense period of flight testing ahead of us. Early on Friday 17th November 2017, Hybrid Air Vehicles’ (HAV) highly trained test team sprang into action and Airlander was expertly guided into the sky by Chief Test Pilot Dave Burns on her sixth test flight, the first in this next stage of expanded flight tests. Airlander has now embarked upon the 2nd phase of test-flying, known as Airworthiness Release 2a (AWR2a). Having EASA, our regulator, validate the flight test data so far and agree that we are safe to fly in a wider range of conditions is an important moment in Airlander’s journey. AWR2a permits Airlander to fly higher (up to 7000 feet), faster (up to 50 knots) and further away from its airfield (up to 75 nautical miles away), but most crucially allows her to undertake display and demonstration activity. A number of modifications were carried out in preparation for this next phase of testing; the most noticeable change is the fairing attached between the hull and the mission module, which will reduce drag at the higher speeds at which the Airlander will be travelling. The new fairing (between the Cockpit and the bottom of the hull) can be seen in the images above. Chief Test Pilot Dave Burns was joined by Andrew Barber, as Flight Test Engineer (Andrew’s full working title is Airworthiness and Flight Safety Engineer), whilst Allistair McDicken, Interim Head of Flight Test Organisation & Lead Flight Test Engineer, looked on from the ground. “It was a fantastic new flying experience and I am very excited about soon being able to fly on the Airlander around the UK and share some of that thrill with more of the country.” Said Andrew Barber, who was on board the Airlander for the very first time today. 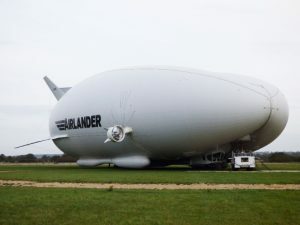 Founded in 2007, Hybrid Air Vehicles is the company behind the innovative Airlander range of hybrid aircraft. Airlander’s create new capability in the air with ultra-endurance combined with large payloads. This gives unprecedented surveillance, search and communications aspects, and will ultimately lead to passenger and cargo carrying roles. The Airlander 10 combines the best characteristics of fixed-wing aircraft with lighter-than-air technology to create a new breed of hyper-efficient and sustainable aircraft, with significantly lower pollution – including noise, its carbon footprint or other particles. This green aircraft also has significantly lower operating costs and maintenance needs than standard forms of air transport. They can take off and land from unprepared sites in desert, ice, water, or open field environments in a short distance. Airlander 10 is designed to stay airborne for up to five days at a time to fulfil a wide range of communication and survey roles, as well as cargo carrying and tourist passenger flights. Hybrid Air Vehicles has been awarded both UK and European* grant funding to support the Airlander project. In addition the company has carried out two ‘crowdfunding’ rounds and is proud to have more than 2000 enthusiastic shareholders. Hybrid Air Vehicles Ltd was recently accepted onto London Stock Exchange’s ELITE programme for high growth companies looking to seek a listing on the AIM Stock Market. Over the past few years Hybrid Air Vehicles has won a number of awards which validate our technology, and the great workforce that have created a unique concept and product. Our award successes reflect our remarkable achievements, won through dogged entrepreneurial determination and private investment spanning 40 years. 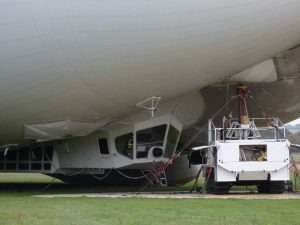 Hybrid Air Vehicles recognise the critical role Airlander plays in inspiring future Scientists, Technologists, Engineers and Mathematicians and we actively educate and encourage young people into STEM careers through collaboration with industry leaders, government bodies, educators and individuals. HAV currently employs 3 Apprentices, who are studying at Bedford College. *The Airlander project was selected for EU funding through a dedicated SME Instrument of Horizon 2020, which the European Commission uses to invest in and support high growth and highly innovative small businesses. The technology is also fully in line with activities under the Smart, Green and Integrated Transport Societal Challenge of Horizon 2020, which aims to boost the competitiveness of the European transport industries and achieve a European transport system that is resource-efficient, climate-and-environmentally-friendly, safe and seamless for the benefit of all citizens, the economy and society. For general media enquiries, contact media@hybridairvehicles.net or call 01234 336400.